Tony Visconsi and Sean Wall of Hanna Commercial represented Top Golf in the recent purchase of a premier 16 acre parcel of land located in Independence, Ohio. Top Golf is a world class sporting and entertainment facility that features fun and competitive golf games for all ages with climate-controlled hitting bays for year round play, an impressive food and drink menu, private spaces for corporate events, and massive HDTVs for watching sporting events in an exciting, upbeat environment. Top Golf plans to break ground immediately on the land next to Embassy Suites at 5800 Rockside Woods Blvd in Independence, Ohio. 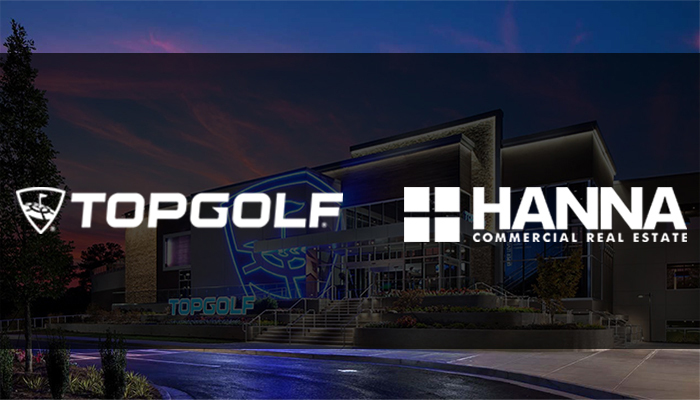 The new Top Golf location in Independence will be strategically central to the entire Cleveland market, will benefit from tremendous exposure on I-480 and I-77 with visibility to over 250,000 vehicles per day, and be an amenity to the surrounding office population in Independence. Tony Visconsi and Sean Wall represented Top Golf and assisted them with extensive research of Northeast Ohio opportunities, site selection, contract negotiation, and obtaining an economic incentive package from the City of Independence. With a planned opening of Fall 2019, the new $25 million dollar entertainment center will be 65,000 square feet on three levels, and will employ up to 500 full and part-time employees, providing a local economic impact of over $265M in a ten year period.